German V-1 bombers fly overhead, threatening to turn a hospital into a smoking crater, but the real danger to the doctors and nurses comes from within in Sidney Gilliat�s Green for Danger. The year is 1944, and a postman, Joseph Higgins, a casualty of the German bombardment, has mysteriously died on the operating table at an emergency hospital set up in a country mansion. When a nurse who claims to have evidence that his passing is no accident is murdered shortly thereafter, the stage is set for a classic whodunit. Based on a popular wartime mystery by author Christianna Brand, Green for Danger is an interesting mix of humor, character drama, and murder mystery. Written and directed by Sidney Gilliat, who along with his producing partner Frank Launder had previously written screenplays for Alfred Hitchcock, most notably The Lady Vanishes, brings a flair for underplayed wit and sardonic comedy to an otherwise somewhat routine thriller. A lot of credit goes to Alastair Sim, who plays Inspector Cockrill, the Scotland Yard detective called in to investigate the string of murders. Hardly the infallible Sherlock Holmes, he�s a bumbling character who is constantly ducking and tripping, mistaking loud noises for bombs falling even as he makes rather astute observations about the deaths and his suspects and very nearly claps with glee when presented with such a fascinating case. Of course, his theories aren�t always right�we see him reading a mystery novel and, a third of the way through, flipping to the end with a confident smile; his face soon falls and he mutters, �I must be getting old.� He makes plenty of errors in solving the real world crime too, and it doesn�t seem a stretch to suggest that he�s feeling the same stress as the doctors and nurses struggling through in wartime. Cockrill is rather more compelling than the case at hand, though as mysteries go, Green for Danger is a fine one, a medical procedural that clearly lays out the suspects (a host of doctors and nurses played by familiar British actors, among them Leo Genn, Trevor Howard, Sally Gray, and Rosamund John) and all the clues you�ll need to solve the crime. Despite some obvious red herrings and questionable motives, it all works well, but some of the soap opera subplots (love triangles, mysterious twins) feel a bit less compelling than they should. Never straying into parody, the movie nevertheless displays a sense of fun despite a grim setting and must have been great escapist entertainment for audiences in 1946 (it proved to be a big hit and cemented Sim�s status as a comedic star). Despite the memorable sardonic dialogue, there�s a dark undercurrent, aided by Wilkie Cooper's moody, occasionally stylish photography that makes good use of shadow and suggestion (in fact, the American Society of Cinematographers included it on their list of the best-photographed films of the 1940s), which gives the pictures an almost schizophrenic, but never off-putting atmosphere. Director Gilliat seems fascinated by the medical procedures, the workings of an anesthesia machine, and all the associated jargon, material that�s still a lot of fun even in the age of Grey�s Anatomy. Sim obviously had a long, successful career after Green for Danger, but I�m kind of sad that this is the last we ever saw of Inspector Cockrill�all the more reason to enjoy him here. Image Transfer Review: A clean looking restoration for this one, without a lot of dirt or scratches and a nice, clear image. Audio Transfer Review: The original audio track is fine. Dialogue is clear and generally well-supported, and the music and sound effects only have a bit of the shrill, tinny sound I typically associate with older mono recordings. Extras Review: The extras are by no means plentiful, but certainly up to Criterion�s usual standard. The commentary by film historian Bruce Eder, taken from the 1993 laserdisc edition, provides a good mix of film history and analysis and trivia about the actors and director. It gets a little dry in spots but remains fairly interesting. 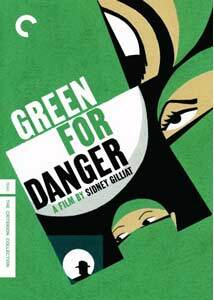 There�s also a nice 14-minute interview with British film historian Geoff Brown, who discusses the history of the Gilliat/Launder pairing and Green for Danger in particular. Interspersed throughout are clips from the duo�s other films, including The Lady Vanishes. There�s a nice 16-page booklet with a somewhat overblown essay by film scholar Geoffrey O�Brian and a short remembrance from director Sidney Gilliat along with a cast list and notes on the restoration. I also have to praise the art designers on this one�the art deco illustrations on the cover, disc and insert are pretty darn cool. Maybe not a great film, but certainly a classical whodunit shot with style and infused with British wit, it�s no mystery why Criterion has given its blessing (and typically fine treatment) to Green for Danger.